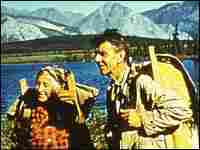 Mardy (left) and Olaus Murie, pictured here in 1956, were both passionate defenders of wild places. 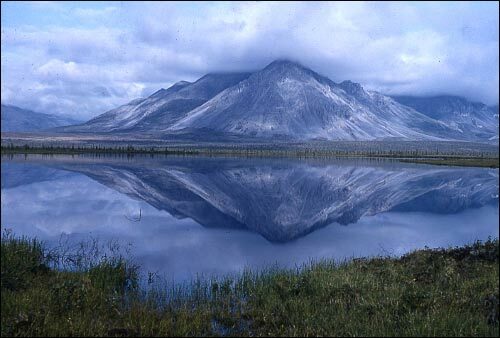 Their efforts to preserve a pristine area in northern Alaska led to the creation of what would become the Arctic National Wildlife Refuge (ANWR). 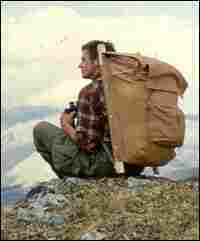 George Schaller, pictured here on the original 1956 expedition to the Sheenjek River Valley, went on to become a world-renowned naturalist. Limestone peak in the Sheenjek River Valley, reflected in Last Lake. 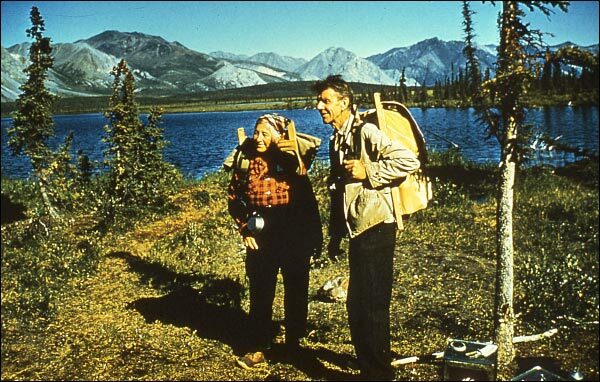 In July of 1956, wilderness activists Olaus and Mardy Murie made an expedition to the upper Sheenjek River of Alaska's Brooks Range to inventory the wonders of an all-but-untouched wilderness. 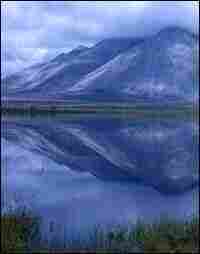 Their survey of the region set in motion the effort to protect what is now the Arctic National Wildlife Refuge (ANWR). 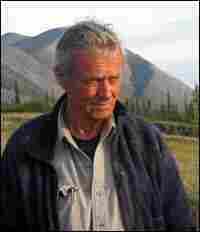 George Schaller, a young field biologist who volunteered for the trip, went on to become a world-renowned naturalist with the Wildlife Conservation Society. To celebrate the golden anniversary of that first voyage, he returned to the Sheenjek. He found the region still pristine -- and yet still threatened by the potential for development and oil exploration. 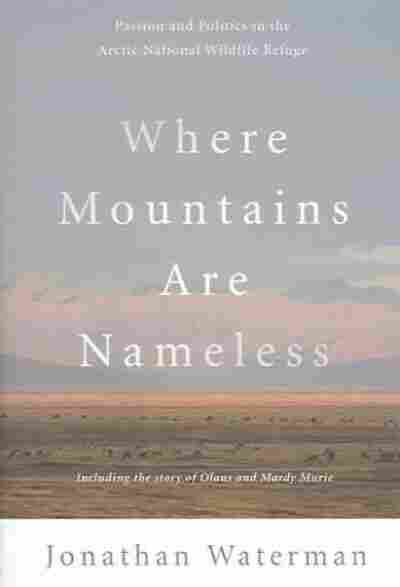 In a film created after their 1956 voyage, the Muries described a naturalist's paradise -- a wide-open valley defined by a sinuous river and towering limestone peaks, a place where even superlatives seem small. The expedition was the start of a growing movement to protect the wild area from development. President Eisenhower was eventually persuaded to set aside eight million acres as a preserve. 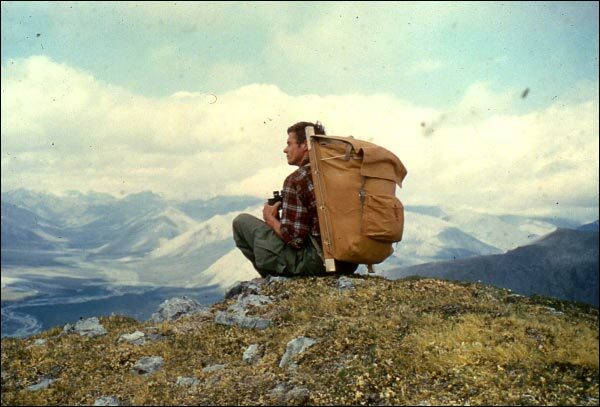 That was later expanded to 19 million acres and renamed the Arctic National Wildlife Refuge in 1980. It was the culmination of Olaus Murie's life's work. Armed with photographs and records from the original expedition, Schaller and a group of graduate students conducted comparison studies to look for signs of climate change. 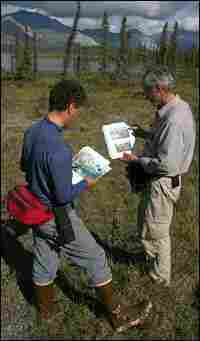 "Olaus and Mardy would be pleased," he says of the 2006 expedition. "Have the trees grown? Are there new trees in the picture? "There are -- so things are going at their own slow pace here in the Arctic," Schaller says. "And that is, in many ways, how Olaus and Mardy worked -- one step at a time, learning, advocating." Just like Murie, Schaller is a steadfast advocate of preserving the area's wildlife. He refuses to be complacent, even though the area appears as pristine as it was 50 years ago. "I'm happy to be here, and to see that the place is intact," he says. "But now there's this feeling of apprehension -- of guilt, even --that this place isn't safe. What will it be like in 50 years? "One of the things that Olaus and Mardy left with me is that you must do something beyond yourself," he says. "And conservation is one of the most basic things you can do. For Olaus and Mardy's sake, I really wish that this will forever remain a memorial to their vision." This, then, is the Sheenjek country. The Arctic wilderness of the Brooks Range. Will we have the wisdom to cherish such places? To leave such parts of the earth in their natural state, humbly and with appreciation? Jon Waterman, the organizer of the 2006 expedition, is a grant recipient of the National Geographic Expeditions Council, a program dedicated to funding exploration of largely unrecorded or little-known areas of the Earth, as well as regions undergoing significant environmental or cultural change. Since its inception in 1998, the Expeditions Council has funded projects that span the entire spectrum of exploration and adventure. Through the great stories these projects generate, the National Geographic Society hopes to foster a deeper understanding of the world and its inhabitants.